This week get Labyrinth of Refrain: Coven of Dusk on Nintendo Switch for £26.99, dood! 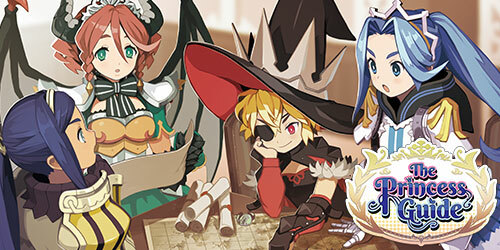 Are you ready to experience the latest RPG adventure from the creators of the Disgaea series? Q1. For those who aren’t familiar with The Princess Guide please could you shed some light on the series for newcomers? AC: The Princess Guide is kind of a spiritual successor to Penny-Punching Princess, which was a level-based beat-‘em-up with beautiful 2D isometric graphics. In Penny-Punching Princess, players were put in the shoes of a princess trying to get her kingdom back, but in The Princess Guide, players are put into the shoes of an instructor, whose job is to instruct and guide a princess to be the best ruler she can be. The way players do that is through the “Praise or Scold” mechanic. Unlike previous games we’ve released, The Princess Guide doesn’t feature any suggestive themes. Each of the four princesses has their own character traits such as being lazy, quirky, and gluttonous, and by praising or scolding her at the right time, you’ll actually get buffs in battles or change the outcome of the story by increasing her admiration toward you. The story of each princess takes about 10 hours to complete, and with three different endings for each princess, there’s a lot of content there for players. In The Princess Guide, you also have a Squad that accompanies you during missions, that Squad has various classes from mages to melee fighters. When you’re fighting enemies, these various classes will come in handy against them, adding a strategic element to the game. Q2. With the four princess knights to choose from, how do players decide which one they would like to train? AC: Whichever one they feel the waifu vibe from the most, is the one they should choose to train. Or, more seriously, at the beginning of the game allows you to view a short story introduction to each character where you can play a short chapter complete with about 5 missions. After that, you can choose a princess to finish the rest of the game on. Q3. How are the princesses different when looking at their combat styles and motivations? AC: Each princess has the same goal of wanting to be the best princess they can be, but each one has different strengths and weaknesses, both personality-wise and combat-wise. One of them is a mage who can use strong magic attacks, one of them is a knight who’s suited to melee combat, one of them is a dragon who can fly around, and the last one wields a machine gun. Each of them has a different play style, so there’s definitely a reason for wanting to play as them, in addition to the story content each of them has. Q4. Which of the princesses is your favourite and why? AC: My favourite is the dragon princess Alpana; I just think she’s really cute, nothing more! I don’t normally like demi-humans and stuff, but dragons are pretty cool, right? AJ: For me, I don’t really have one right now, but in terms of aesthetics, I would have to go with Liliartie, the princess who looks like a knight. I really like the look of her and she seems really cool! This week get The Legend of Heroes: Trails of Cold Steel II (PS3) for £20.99! From the creators of Ys, Xanadu and Brandish series comes the latest The Legend of Heroes instalment. In The Legend of Heroes: Trails of Cold Steel II you join Rean and the members of class VII as they battle to reclaim Erebonia from the forces causing an unsettling civil war in the country.